A £2.3m mechanical lift in Blaenau Gwent has broken down more than 250 times at a cost to the council. The cable car, which links Ebbw Vale town centre with the former steelworks site, opened in 2015. But BBC Wales has learned the lift, which costs £52,000 a year to run, had to be stopped 252 times from 2015-17. Blaenau Gwent council said some of the breakdowns were due to vandalism and incidents had reduced since the introduction of "on-site personnel". 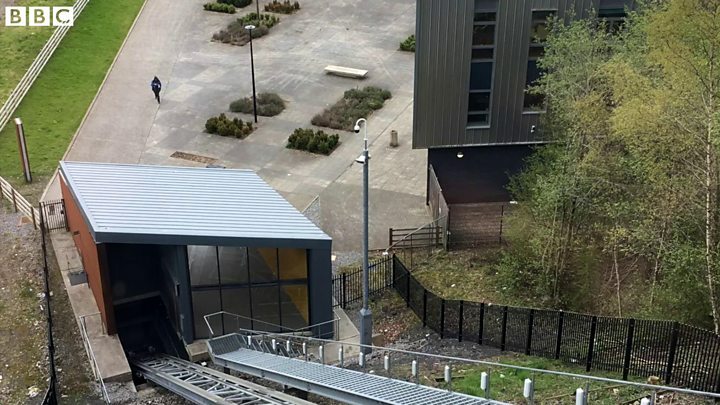 The lift was installed in 2015 to help pedestrians travel easily between Ebbw Vale town centre up and down a steep hill to the former steelworks site - which is now home to a college campus - a school and the Gwent Archives. It was paid for with part of a £12m European Convergence Programme grant. Blaenau Gwent council was forced to close the lift on 252 occasions between June 2015 to November 2017, a Freedom of Information (FOI) request by BBC Wales has revealed. During this period the cable car, which travels 140ft (43m) between two stations, dropping 75ft (23m) as it descends, was unmanned and relied on remote CCTV monitoring. The majority of the repairs took an hour of officers' time and related to "minor interference with cableway doors". However, other repairs include: three door control boards (£628 each), two sets of hydraulic hoses (£2540 total), a guide rail roller (£350) and an emergency stop (£2500). The council said: "The Ebbw Vale cableway has many sensitive safety features and was installed to comply with strict health and safety requirements. "Following the introduction of on-site personnel from November 2017 the number of stoppages has been significantly reduced and to current date has only been stopped on four occasions." It added: "The cableway is a popular, quick and accessible link from the Works site to Ebbw Vale town for students and residents. "It also provides a safe transport link to the town centre for disabled users. Since the cableway opened it has made over 170,000 trips to and from the town centre or over 400 trips every day."